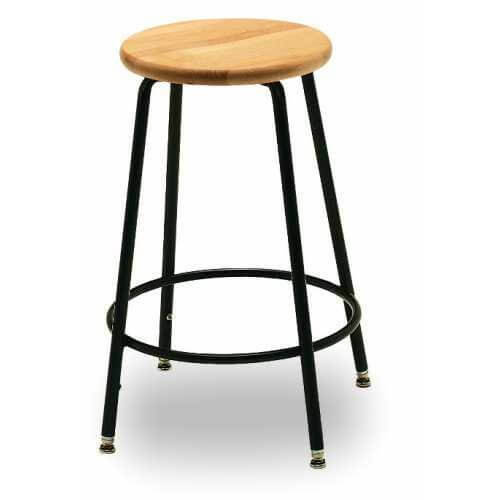 The Wenger adjustable ensemble stool features telescoping legs, a black-enamel frame and three choices of seats. It's handy, convenient, and always in demand all over your facility. This model is the Standard model with wood seat. Standard model with wood seat. 3/4” (1.9 cm) contoured beech wood that is completely sealed. 16-gauge steel legs and 16-gauge steel footring in black powder-coated paint finish. Telescoping legs enable seat height adjustments between 25” and 33” (64 and 84 cm) tall. Telescoping legs are infinitely adjustable within the 8” (20 cm) range with markings to denote every 1-1/4” (3.2 cm). Self-leveling, non-marring leg glides. Environmental attributes and LEED compliance for this product can be found at www.wengercorp.com/GREEN or by contacting your Wenger representative. Stool ships ready to assemble in one package. Assembly is quick and intuitive with only eight fasteners. 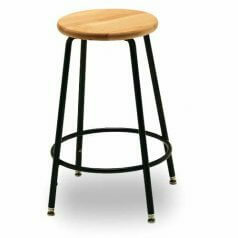 Other models available: Standard model with polyurethane foam seat - 1-1/4” (3.2 cm) polyurethane foam for a softer feel. Premier model with padded and upholstered seat - 2” (5 cm) padding on 3/4” (1.9 cm) wood substrate covered with black Olefin fabric.